MARTIN, Tenn. – FACULTY AND STUDENTS ATTEND PRE-MED SCHOLARS BREAKFAST – Members of the University of Tennessee at Martin’s Pre-Med Scholars Program and several UT Martin faculty attended a breakfast Sept. 22 in the Dunagan Alumni Center. Mikaela Hardy Holland, a 2016 UT Martin graduate from South Fulton, spoke on her experiences as a student at first UT Martin and then the UT Health Science Center College of Medicine. 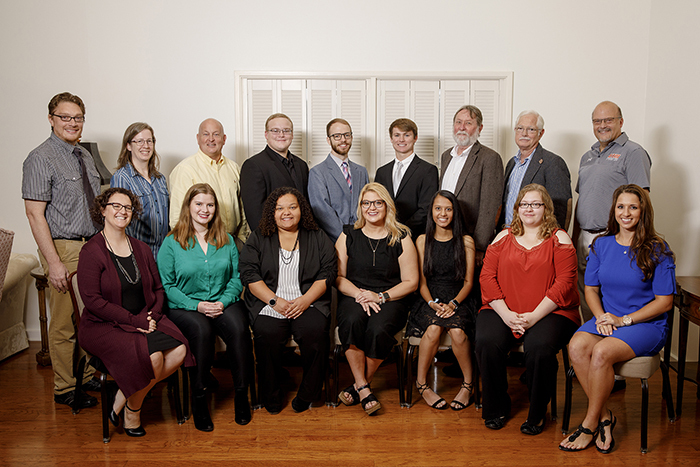 Pictured are (front row, l-r) Kristina Pitz, coordinator for the UT Martin Health Sciences Pre-Professional Program; Kristina Kaul, a senior from St. Louis, Missouri; Aleya Brent, a senior from Dresden; Lexie Bolin, a junior from McKenzie; Anjalee Patel, a junior from Ripley; Madison McClure, a senior from Yuma; Holland; (back row) Dr. Shadow Robinson, dean of the College of Engineering and Natural Sciences; Dr. Jennifer Greenwood, chair of the Department of Biological Sciences; Dr. Keith Carver, chancellor; Stephen Richardson, a sophomore from Martin; Ben Allen, a sophomore from Trenton; Luke Spivey, a sophomore from McKenzie; Dr. Jack Grubaugh, professor of biology; Dr. Rick Thomas, professor and chair of the Department of Chemistry and Physics; and Dr. Phillip Acree Cavalier, provost and vice chancellor for student affairs. For more information on the Pre-Med Scholars Program, contact Pitz at 731-881-7478.